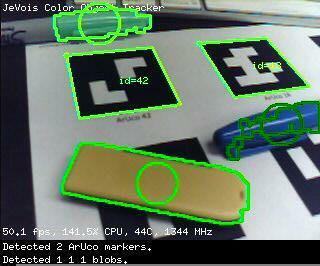 Combined ArUco marker + multiple color-based object detection. This modules 1) detects ArUco markers (small black-and-white geometric patterns which can be used as tags for some objects), and, in parallel, 2) isolates pixels within multiple given HSV ranges (hue, saturation, and value of color pixels), does some cleanups, and extracts object contours. 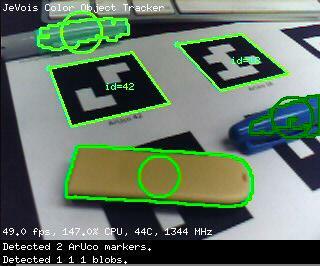 It sends information about detected ArUco tags and color objects over serial. This module was developed to allow students to easily develop visually-guided robots that can at the same time detect ArUco markers placed in the environment to signal certain key objects (e.g., charging station, home base) and colored objects of different kinds (e.g., blue people, green trees, and yellow fires). This module usually works best with the camera sensor set to manual exposure, manual gain, manual color balance, etc so that HSV color values are reliable. See the file script.cfg file in this module's directory for an example of how to set the camera settings each time this module is loaded. The number of parallel blob trackers is determined by parameter numtrack, which should be set before the module is initialized, i.e., in the module's params.cfg file. It cannot be changed while the module is running. To configure parameters hrange, srange, and vrange for each detector in the module's scrip.cfg, we recommend that you do it one by one for each kind of colored object you want, using the ObjectTracker module (which shares the same color blob detection code, just for one HSV range) and the tutorial on Tuning the color-based object tracker using a python graphical interface, or the sliders in JeVois Inventor. Just make sure that both modules have the same camera settings in their respective script.cfg files. which basically means that, on frame 1557, ArUco markers U42 and U18 were detected, then blob detector named "blob0" (configured for light blue objects in script.cfg) detected one blob, then "blob1" (configured for yellow) also detected one, and finally "blob2" (configured for green) found one too. That was all for frame 1157, and we then switch to frame 1158 (with essentially the same detections), then frame 1159 (note how blob0 detected 2 different blobs on that frame), and so on. See Standardized serial messages formatting for more info about these messages. Make sure you do not have conflicting settings in the module's params.cfg or script.cfg file; as a reminder, the order of execution is: 1) initscript.cfg runs, which loads the module through the setmapping2 command; 2) as part of the loading process and before the module is initialized, settings in params.cfg are applied; 3) the module is then initialized and commands in script.cfg are run; 4) the additional commands following setmapping2 in initscript.cfg are finally run. Next time JeVois starts up, it will automatically load this module and start sending messages to the hardware 4-pin serial port, which you should then connect to an Arduino or other robot controller. # module is loaded, BEFORE it is started. # any of the system parameters). # AFTER it is started. # interactively into the JeVois command-line interface. # Number of parallel threads has to be configured before the module is initialized. See params.cfg for this module.